It’s the new year and most Sydney cafés have closed to take a well-earned rest. Some remain open, especially those which double as evening restaurants. Una’s is a café and licensed restaurant with dishes influenced by various European countries – Germany, Austria and Hungary amongst them. While the breakfasts contain very little European influence, the dinner menu contains items such as Vienna or chicken schnitzel ($18.50 each), Jager (mushroom sauce) or gypsy (spicy Hungarian capsicum sauce I was told) schnitzel ($20.50 each), Kassler ($18.50) and various strudels and cakes. Imported and local beers ($7 each) as well as wine by the glass or bottle are also available. Being a weekday, things were relatively quiet when we arrived yet the lone waitress was being kept busy. She was friendly and quick though as she cleaned our table and brought the menus. We delved into a flat white and skim cappuccino ($3). 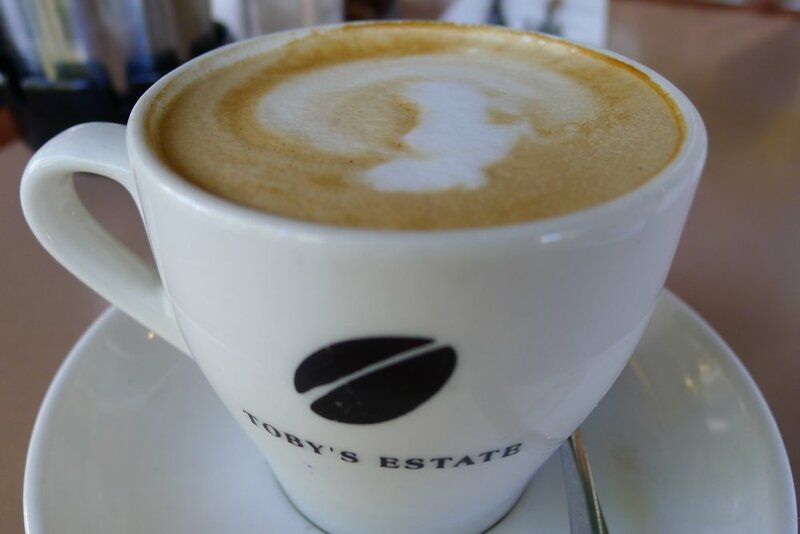 We enjoyed both of the Toby’s Estate cups although they were slightly bitter. 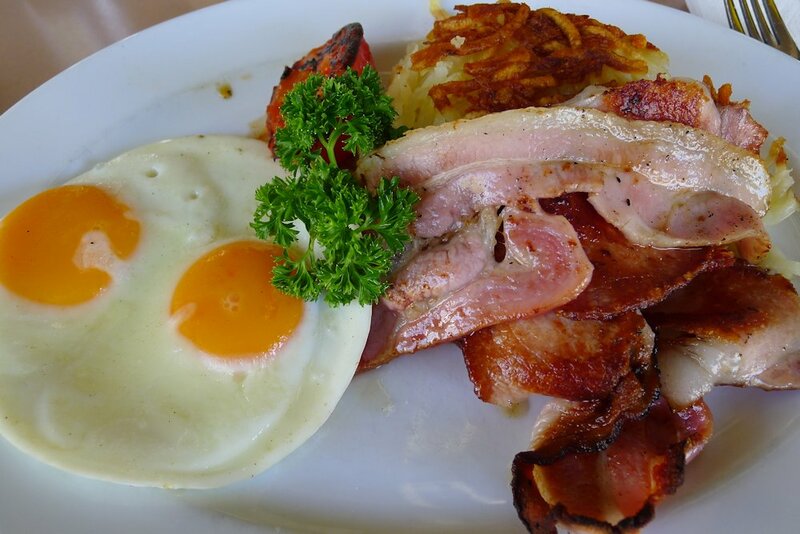 The breakfast menu is not vast: eggs are available with bacon, ham or sausage ($10.20 each), big breakfast ($12.30), vegetarian breakfast ($12.30), omelette ($14.20) as well as porridge ($7.70) and muesli ($7.90). 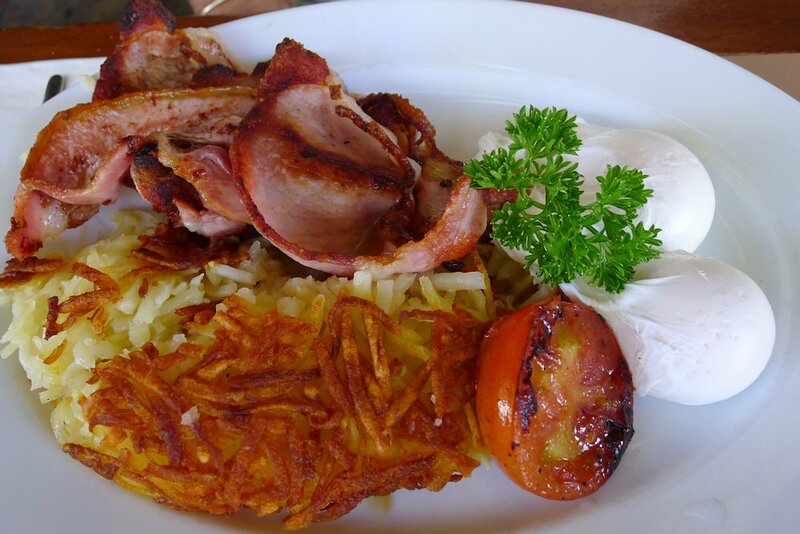 The bacon and eggs as well as other hot dishes are served with potato rosti, tomato and buttered toast. Our portions were large for the price with plenty of bacon an oversized rosti both of which unfortunately contributed a large amount of oil to the dish. We’re all for homestyle cooking with butter and oils however in this case there was too much. 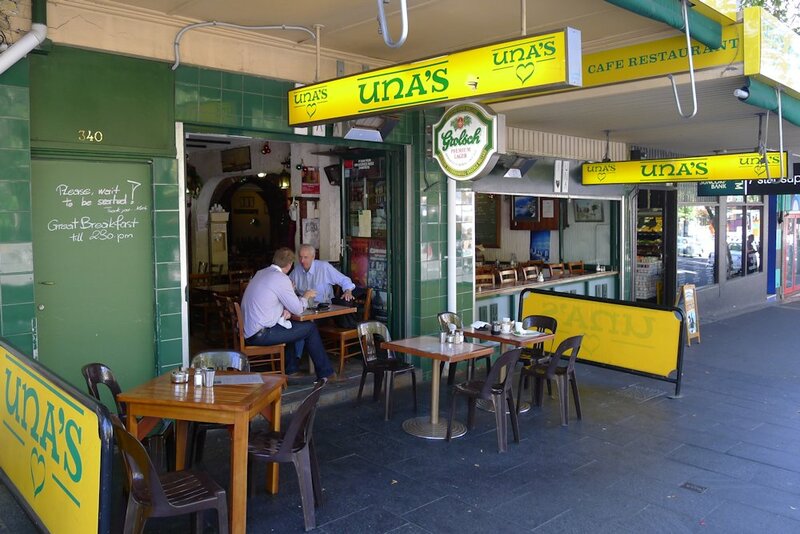 We’ll try anything once though so if we’re in the area, and feel like a Kassler, we will try Una’s for dinner. There are better options in the area for breakfast though.